Part of the Social events category. Join us as The Virginia Museum of History & Culture partners with Capitol Opera Richmond to present outstanding local singers in a 90-minute production of La Bohème, Giacomo Puccini’s timeless tale of love and loss. 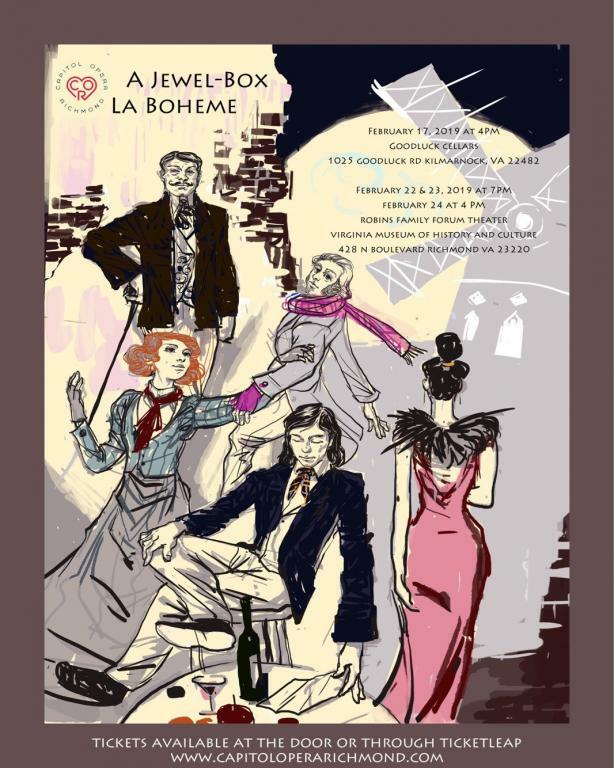 Presented in the Jewel-Box format, this production has been condensed and theatrically focused into a shorter performance that does not include an intermission. The romantic and tragic story line, as well as the main arias and duets, have all been retained, resulting in an experience that is satisfying for aficionados, but accessible to new and younger audiences interested in one of the world’s most popular operas. This program is presented in partnership with Capitol Opera Richmond. Capitol Opera Richmond is a non-profit, all volunteer organization founded to act as a resource and information center for "Voice Professionals" of all types, and to make classical music, particularly opera, accessible to a wider audience.